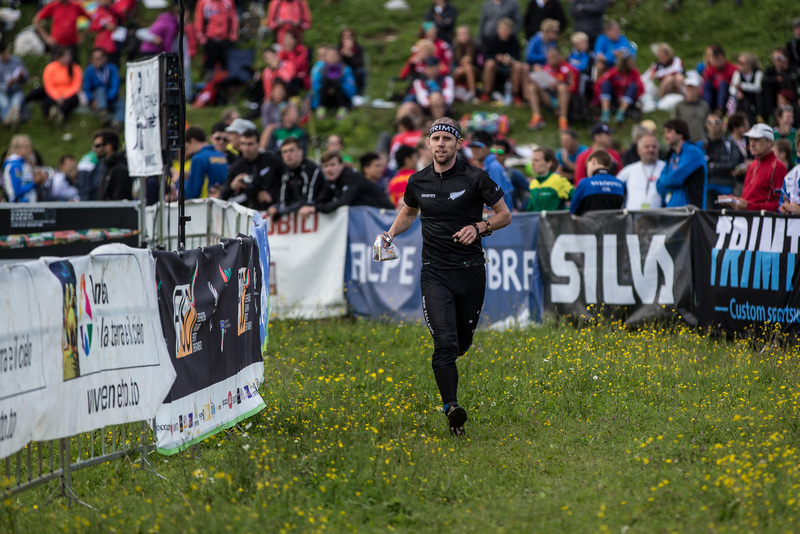 The Middle Distance at WOC is a bit like the 1500 m at the Olympics – probably considered by men as the blue ribbon event – generally the most technical of the terrains and this year at an altitude of 1500-1700 m in the forest and alpine meadows of Campomulo. What’s more the sun shone (for the first time since Venice), the arena was nicely situated with grassy banks making viewing a pleasure, and the ringing cowbells would have made the hardiest Chiefs fan feel at home. 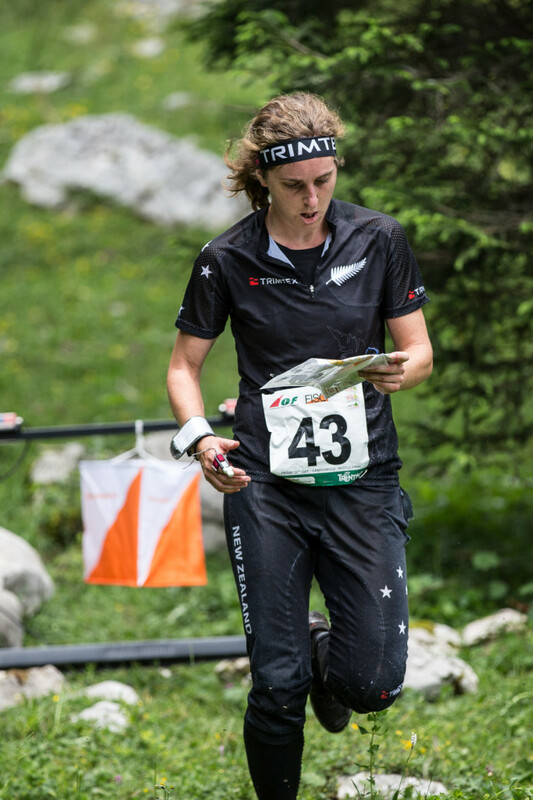 The women were first off and a thrill went through the Kiwis in the crowd as Lizzie, 43rd on the start list, was announced as fastest through the first radio control – a position she subsequently held for a long time. Sadly, not for the first time during the week the course setter failed Course Setting 101 by putting a control in the bottom of a pit. Not seeing it, or the woman guarding it, and overshooting, plus a bit more lost time on the subsequent leg as she steadied herself again, cost Lizzie 2 minutes. A further minute on control 14 and Lizzie’s 43m 06s was 20th place rather than knocking on the door of the top 10. Nevertheless, seven top twenty finished in the last 4 years is a record anyone can be proud of. Ross, starting some 2 hours later also had the Antipodeans in the crowd on their feet as he too raced through the first radio control highly placed. However, overshooting in a similar area to Lizzie and needing to relocate was his downfall, costing over 4 minutes. The steep climb back towards the arena then took its toll and it was a disappointed and exhausted Ross who came in 58th. Both he and Lizzie felt the terrain to be even more physical than the model event the previous day, with very rocky ground and unremitting steepness. At the business end of the women’s race it initially looked as if Tove Alexandersson, after 6 silver medals, was going to take her first ever world title. But first fellow Swede Annika Billstam stormed through the final loop of course after the arena run-through, then Ida Bobach, despite a mistake at 14 which cost her the gold, pushed Tove further down to 3rd. The real drama, however, came in the men’s race as long distance gold medallist and 7 times winner of the middle distance Thierry Gueorgiou decimated the field to come in with a time of 37 minutes dead and a margin of over a minute on Olav Lundanes. Then, to a stunned crowd, it was announced that Thierry had missed control 6 and the title was going to Lundanes. For those who remember the World Cup race on Waikawa 18 months ago, a nice irony, as there Lundanes was fastest but was disqualified for punching a wrong control. 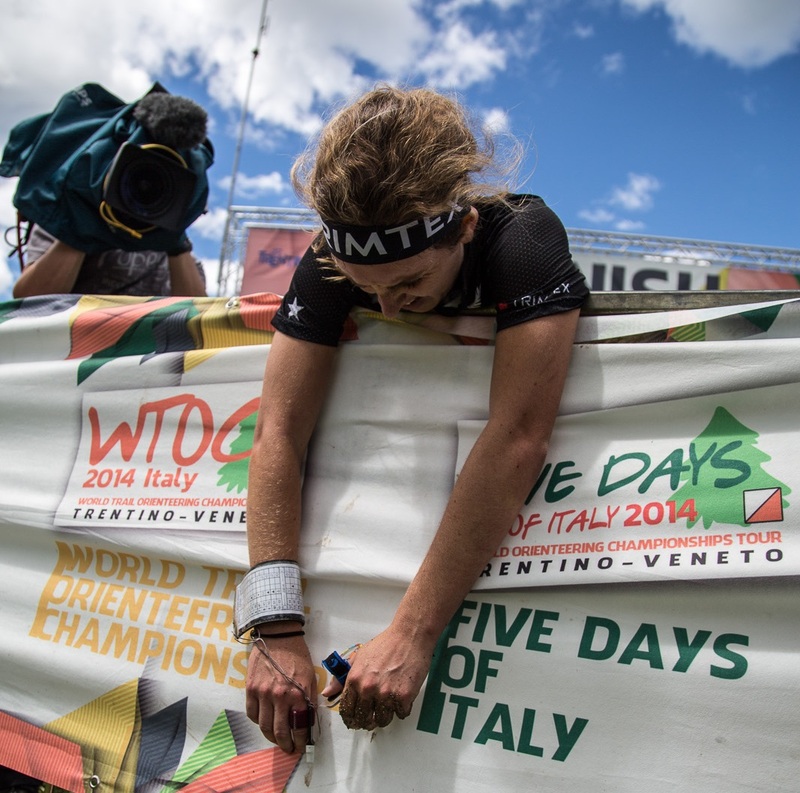 Now the final event – the relay as tired bodies and legs (for Lizzie and Ross anyway) head back to Campomulo tomorrow for another bite at the cherry. The women go first again with Greta on the first leg, Lizzie running second, and Imogene on the last leg. Just finishing will secure them promotion to group 2 for 2015 in Scotland meaning 2 women in each of the long and middle distances. For the men Tim will start off, as he will at JWOC in 10 days time, handing on to Ross and then to Matt on the anchor leg. A harder job face these guys in a field of 34 teams with the aim having to be top 20.